On Monday afternoon, the top linebacker in the state of Tennessee in the 2019 recruiting cycle, Kane Patterson, elected to commit to Ohio State over offers from the Vols, Alabama, and others. With his commitment to the Buckeyes, the Vols now have just one commit from the top eight players in the state of Tennessee according to the 247Sports Composite rankings. After missing out on yet another highly-rated player within state borders, should Vol fans be worried about Jeremy Pruitt’s ability to recruit in-state prospects? In short, no. And I’ll explain why. Pruitt has been on the job at Tennessee for barely seven months. He and his staff were working behind the eight ball a great deal to close out the 2018 recruiting class, and they are in the 2019 class a bit as well. They’ve been able to make up ground with a number of prospects, but they also aren’t recruiting in the greatest of circumstances either. Tennessee is coming off their worst season in program history. Other schools in the SEC, such as Alabama, Georgia, and Auburn, have a lot more recent success to point to when recruiting top talent across the country and in the state of Tennessee. Even South Carolina has had more recent success than the Vols in football. 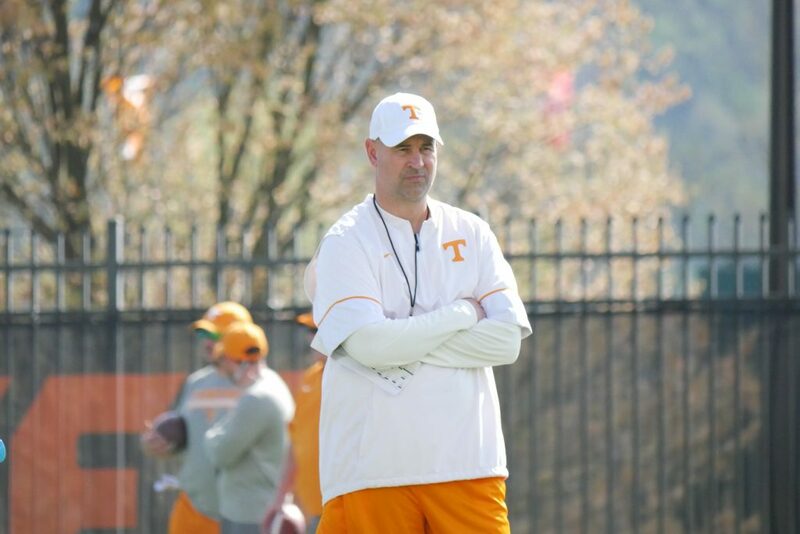 For the 16, 17, and 18-year-old prospects Pruitt and his staff are currently recruiting, the Vols have been in the basement far more than they’ve been relevant in their short lifetimes. Most rising high school seniors were only six or seven at the oldest the last time Tennessee won the SEC East. They’ve grown up watching the Vols flounder and come up short more often than not. But a lot of recruits don’t care about the past a great deal. They’re concerned about the future and their next three to four years of college. And that’s why relationships with coaches are a big deal. Pruitt and his staff developed relationships with talented players in states like Georgia, Alabama, the Carolinas, Louisiana, and California at their previous stops. Only rarely were they recruiting players in the state of Tennessee before coming to Knoxville. And those relationships are very important to recruits and their families. Players like Maurice Hampton, the state’s top cornerback, are a prime example. Hampton has been committed to LSU since 2016. Pruitt wasn’t even at Tennessee when he committed elsewhere. He and his staff are still working hard on trying to flip him and four-star defensive end Bill Norton who committed to Georgia back in March of this year, but it shouldn’t come as a big surprise Hampton and Norton committed to other SEC schools over the Vols given the circumstances. The No. 1 player in the state, Lance Wilhoite, never made the SEC a big priority. He committed to Oregon on June 28th and had mostly taken visits to schools outside the SEC. The same can be said for four-star cornerback Woodi Washington who committed to Oklahoma recently. Pruitt and his staff have also taken a different approach to recruiting than Butch Jones and his staff did. Pruitt and his coaches put a much bigger emphasis on getting prospects to camp at UT or going to see them at other camps before offering. That’s not always the case, but you’re seeing far less offers from this coaching staff than you did from Jones and his coaches. Pruitt isn’t just handing out offers and recruiting players for the sake of appearances. That’s not to gloss over the fact that this staff has missed out on some talented prospects in the state. Because they have. Tennessee’s coaches would certainly like to have players like Patterson or Norton, and so far they’ve whiffed on them. But it’s also just July, and Pruitt hasn’t coached a single game at Tennessee yet. There’s still time to get some of these in-state recruits to change their minds if the product on the field this fall looks improved. And that’s not to take away from the in-state players Pruitt and his staff have gotten commitments from and are in good spots with. The Vols have a commitment from the top offensive lineman in the state in Jackson Lampley, and they’re in a very good spot with four-star receiver Trey Knox. Defensive tackle Tymon Mitchell, defensive end Zion Logue, and offensive lineman Melvin McBride are other players that UT’s coaches have made a point to recruit harder. Butch Jones tried to “win the state” of Tennessee, and we saw how that worked out. Getting top players from within your own state borders is great, but it doesn’t always have to be a team’s top focus. Especially in a state like Tennessee where the overall talent pool isn’t the deepest. Yes, the state’s talent has gotten a lot better over the last few years, especially in the mid-state area. But when you compare it to states that border Tennessee like Georgia, both the Carolinas, and even Alabama and Virginia, it makes sense why UT has historically recruited nationally/regionally more than locally. It’s too early to really panic about recruiting in any state for Tennessee right now. It’s just July, and the current staff has done well all things considered. They’ve been able to pull talented players from Georgia and Alabama and should have more good news coming later this month with some of their top targets. So far, Pruitt and his staff haven’t pulled in a lot of the top talent in the state of Tennessee. But there’s still plenty of time to change that if this staff really wants to. And if they can get more talented players at the same positions as some of the in-state prospects, then that should trump any concern about in-state recruiting. Simply put, it’s too early to really tell what Pruitt and his staff will do with in-state recruiting moving forward. It’s fair to have concerns, but it’s also fair to wait and see. Time will tell if this staff missed out on great players in the state or if they were right to focus their attention elsewhere.